- To escape a problem. - Due to Peer pressure. - Through prescriptions and self-medication. - To cope with stress. - Rebelling especially in teens. With this in mind, here are detailed top 5 signs that someone is addicted to drugs that you can quickly note. 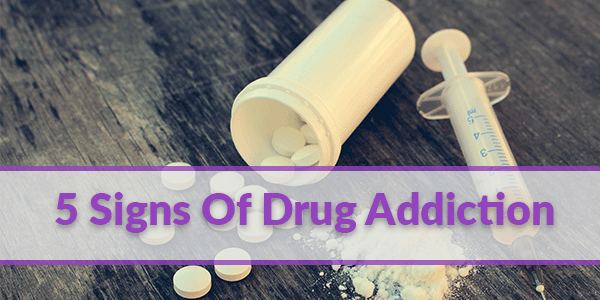 These five are just but a few of the limitless signs of substance abuse. Major Signs of Drug Addiction. Once the body is tolerant of a drug, it will always ask for more and more of it. The user will want to experience the same reaction he had during the previous escapade until the body can no longer do without the drug. Therefore, whenever the drug is absent, they start to experience the withdrawal symptoms akin to those of detoxing. You can quickly note that someone is addicted, by looking for these symptoms of detoxication; nausea, constant headaches, shakes, chills, seizures, psychotic behaviour, restlessness and unreasonable sweating. 2. Change in Physical Appearance. Personal grooming is never at the centre stage of an addict's life. People behave differently once in addiction. Some don't shower or bath while others stop fixing themselves. They move around looking shaggy with uncombed hair and old, torn clothes. Dark circles start to form under the eyes, and it seems like they didn't get enough sleep. Drugs affect people uniquely. Some may cause an increase in weight such as alcohol while others cause them to lose weight rapidly. You have to be keen when observing physical appearances for they can easily be excused by â€lack of sleep' or â€health issues'. 3. Poor Performance at Work or School. A drug user will just choose to go and get a shot of a drug against attending his/her job's general or yearly meeting. You will start getting complaints of a spouses' neglect of work or your irresponsibility at your workplace. Teens on the other hand would rather spend time with fellow users than attending school or do their school work. As earlier mentioned, drugs, once used continuously, quickly take hold of the body. It becomes hard to concentrate, and the user is always anxious. These are all side effects of craving for the substance. Continuous use of drugs to overcome cravings will drag a user deeper into the abyss of addiction. Substance users are best known to act out against anyone who tries to point out their addiction issues, and loved ones always find themselves at the other end of the gun. Fights ensue which may sadly result in a divorce or loss of family. These are just but a few signs of drug or substance addiction. Once you note that you or a loved one has these signs, it could be an addiction. Don't try to fight it alone. Instead, seek the right addiction treatment option and get the support that you need to overcome it easier and faster!